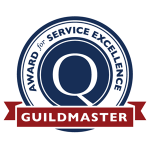 GuildQuality’s 2018 Guildmaster Award Honors M&M Home Remodeling ServicesCrete, IL, April 4, 2018-M&M Home Remodeling Services of Crete, IL received a 2018 Guildmaster Award from GuildQuality for demonstrating exceptional customer service within the residential construction industry. Out of 600+ eligible applicants, M&M Home Remodeling Services is one of 300+ businesses within the residential construction industryrecognized by GuildQuality for consistently delivering superior customer care. M&M Home Remodeling Services achieved a recommendation rate of 90% or above from their customers surveyed by GuildQuality.“We’ve made it our business to create a culture that places customer satisfaction at the top of our priority list” For more on the 2018 Guildmaster Award and qualifications, visit www.guildquality.com/guildmaster/.